It has been installed the MAP®- Magaldi Ash Post-combustor - system, which allows to complete the combustion of the unburned residues from RDF, increasing by more than 4 MWe the generation of electricity and disposing of waste that otherwise would be destined to landfill. The Magaldi Group - the world leader in the design and manufacture of industrial plants for handling of high temperature materials, used in particular for coal-fired power plants, co-combustion of biomass and RDF (refuse derived fuel), cement plants, steel mills, foundries, automotive and mines with headquarters in Salerno – have installed the innovative MAP® - Magaldi Ash Post combustor - System for the extraction of ash and controlled post-combustion of unburned residues from RDF in the largest power producer in Germany. That combined cycle Power Plant of RWE is one of the most modern in the world; Unit K is fed to co-firing coal and RDF. The energy recovered from RDF is 10% of the overall energy produced. The innovative MAP® system, installed in place of a traditional wet system, eliminating the use of cooling water and pollution problems associated, allowing the continuous and reliable extraction of bottom ash, promoting the controlled post-combustion of high fraction of unburned content from RDF, providing final cooling release of materials that can be reused, instead of be treated as special waste. Thanks to the post-combustion of residues from RDF it is possible to obtain a significant recovery of thermal energy to the boiler, about 10 MWt, which increases the efficiency of the boiler and makes possible the generation of 4 MWe of electrical energy, otherwise lost. MAP® technology - developed by Magaldi - coming directly from the already well-known technology of MAC® (Magaldi Ash Cooler) System, the dry bottom ash handling system, installed for the first time in 1985 and now operating in 150 boilers throughout the world, for a total of 53,000 MWe of power generation. Thanks to the MAC® system has been significantly reduced the environmental impact of power plants, due to the elimination of water, previously used for cooling process and the recycling of ash otherwise sent to landfill. 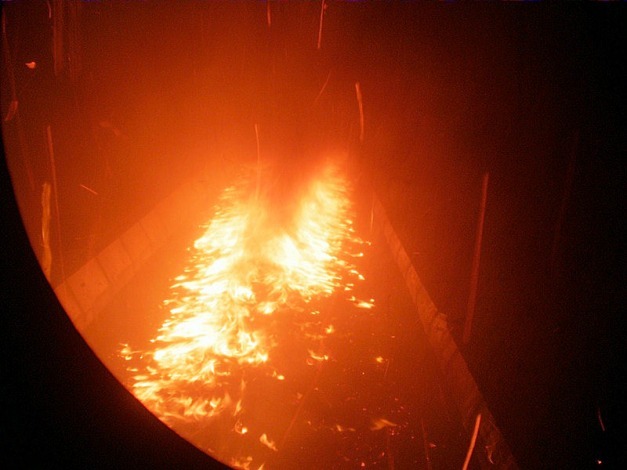 To develop the MAP® System, the Magaldi Group have designed a special conveyor belt very resistant to high temperatures, which has given excellent results in terms of reliability and safe operation -this is the key component of the MAP® system that “integrates” the system to the combustion chamber of the boiler, operating fully automatically. “The MAP® technology is based on our 60 years of experience with conveyor belts operating in high temperature conditions” - said Mario Magaldi, Magaldi Group President - “it is a kind of furnace linear movement that takes the ashes from the boiler and continuing burning process at 800-900 degrees, allowing high energy savings, besides representing an excellent alternative for waste burning process and reducing the use of coal.” “We are very proud to have brought to the German market this innovative technology that allows, for the same calorific value and boilers efficiency, to dispose of urban waste and produce more energy” - continues Magaldi – as per family tradition and with perseverance we continue to invest for decades in our Research department with the creation of hundred of international patents, most of them turned into successful industrial products. The installation of this MAP® System is only the latest of the Magaldi Systems already in operation at a Power Plant in Czech Republic - units k4 and k5 ( 2 x 148 MWt) - with co-combustion of coal and biomass (10% thermal input) and / or RDF (5% heat input) and to those in operation at a Power Plant in Italy - units 3 and 4 (Italy 2 x 320 MWe) - with co-combustion of coal and RDF (5% of thermal input). More than 80 top engineers coming from very important European and International companies had the opportunity to see the MAP® in operation during two Open Days at the Power Station in Germany.